“That’s the beauty of doing research: You do one small thing…and it grows to be something bigger,” says 5th year PhD candidate Aleksandra Swatek. 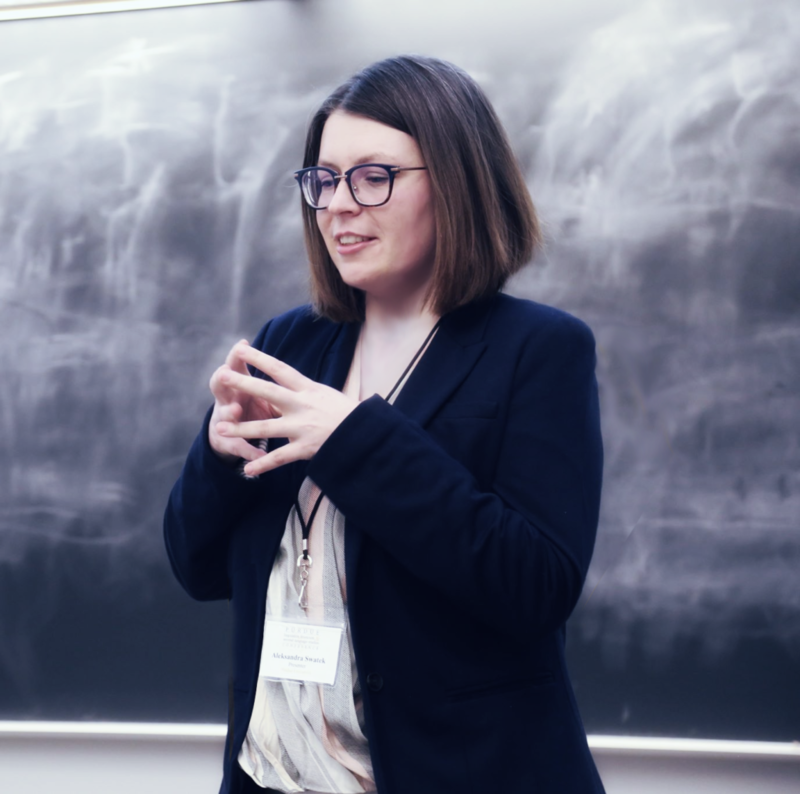 This is certainly true, although one could hardly describe Aleksandra’s research as “small.” Her dissertation seeks to analyze the language of engagement in online instructional videos, specifically math lectures from both Khan Academy and MIT. To do this, she has created a corpus of lecture transcripts from each source—both of which total about 1.5 million words. Aleksandra’s research is uniquely positioned at the intersection of Second Language Studies and Corpus Linguistics, and she draws on methodologies from the latter in a variety of ways. For example, after assembling her data set, she used Sketchengine to analyze and compare the language used in the two corpora. 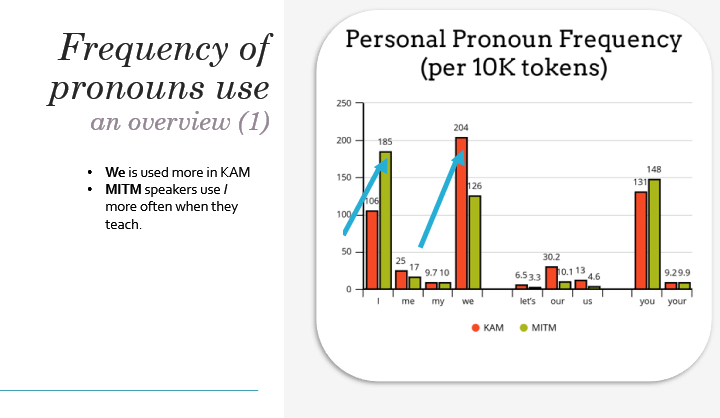 She has already noted differences in the type and frequency of personal pronouns (we, I, you), stance markers (specifically modal verbs), and hypothetical reported speech (imagining how a student might respond). She hopes that the results of her research will help instructors better use language to engage online students, especially as traditional classroom settings transition into online spaces. Aleksandra’s interest in corpus linguistics made her a perfect fit for Crow even before it existed. Initially, she worked with former Purdue professor Dr. Shelley Staples on the Purdue Second Language Writing Corpus, from which Crow eventually emerged. To date, she has been involved in a variety of Crow projects and conferences, including our recent presentation at the Teaching and Language Corpora (TaLC) conference where she helped to debut the Crow platform and collect feedback on our online interface. In collaboration with other Crow members, Aleksandra used our platform to research reporting verbs in student writing. She isn’t slowing down any time soon, either; a new project on formulaic language is currently in the works. Aleksandra’s familiarity with corpora allows her to see and appreciate just what makes Crow unique: an eagerness to share and make data accessible. These attributes make Crow the only active, open-access corpus and repository of academic materials in the world. Aleksandra is excited to be part of a project that will benefit the greater community, particularly those conducting research on student writing. Going forward, she plans to continue doing research and finding ways to bridge the gap between science and humanities. In fact, this is something that occupies Aleksandra’s mind even in her rare free moments. What started as a hobby has turned into a project on the relationships between writing studies communities encompassing rhetoric and composition; second language writing; and technical communication and EAP. She is also an avid Starcraft 2 e-sports fan and a gamer herself. Whether she’s working on her dissertation, analyzing the Crow corpus, or mulling over the role of humanities in the world, there is one thing we know for sure: Crow is lucky to have someone as dedicated to and passionate about accessible data on our team.